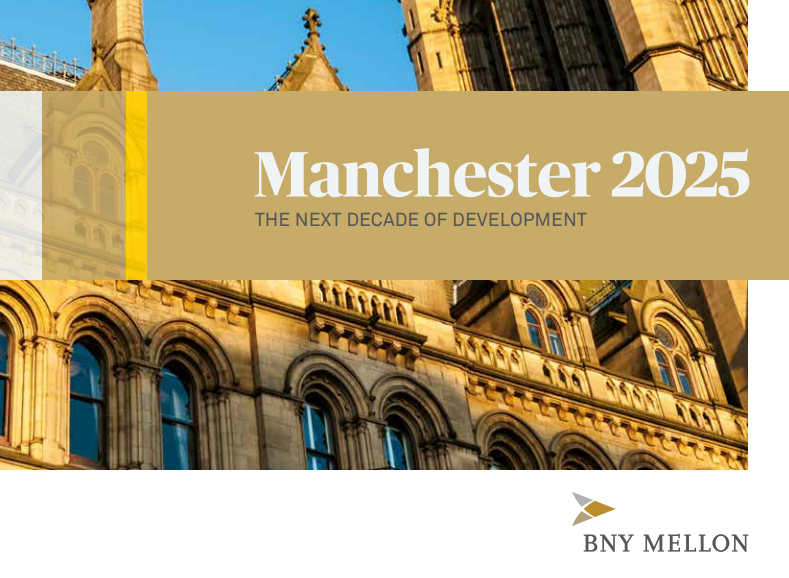 Manchester is poised to create more than 5,000 jobs per year as it cements its position at the centre of the Northern Powerhouse, according to a new report commissioned by investment company BNY Mellon to mark ten years in the city. The report, entitled Manchester 2025, considers areas such as the economy, property development, infrastructure and culture, with contributors including Manchester City Council Chief Executive Sir Howard Bernstein, UKFast founder Lawrence Jones, Mike Ingall of Spinningfields developer Allied London and Tim Newns, chief executive of Manchester’s inward investment agency MIDAS. The report predicts that up to 55,000 jobs, or more than 5,000 per year, will be created in Manchester city centre between now and 2025. It also forecasts that the number of people who live within an hour of Manchester will double from 7 million to 15 million in 2025 due to improved road and rail links.